The Tail of Emily Windsnap by Liz Kessler is a great start to a fantastical series of juvenile fiction books. They follow 12-year-old Emily Windsnap as she discovers that she is half-mermaid and she embarks on a journey to put her broken family back together again. This is a delightful book aimed at the middle grade age group. I work in a library, and each year, it seems that our school groups latch on to a particular series. This past school year, all of the girls wanted books in this series, so I decided to read one to see what all the hype was about. I was so pleasantly surprised by how interesting this book was, and I think it is a great recommendation for young girls. 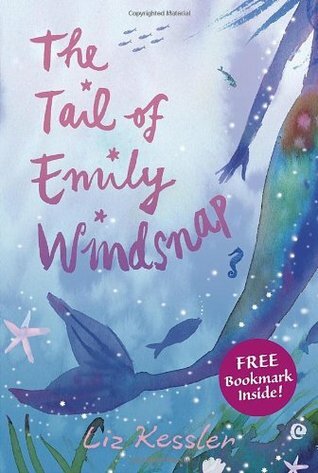 In this book, Emily discovers things about herself and her parents and she struggles to find peace with her mermaid aspects. This could easily be a metaphor for many other things that make some girls feel different from others. In this book, we get to see Emily’s relationship with herself, her mom, her dad, and her friends. For a fantasy genre juvenile fiction book, there was a remarkable amount of character development. Emily faces real hardships and she struggles to overcome a lot of things. This was great book, and I’m actually really interested to see what happens next. If you have a daughter, niece, etc. who needs a summer reading recommendation, I think this is a great one!